YFN Lucci recently reached a career milestone when he peaked at #1 on the Urban radio charts with "Key To The Streets" featuring Migos and Trouble. Although the success tastes sweet, the Think It's A Game rapper won't be caught taking his foot of the pedal as he continues to make new music and prepare a new album for 2017. 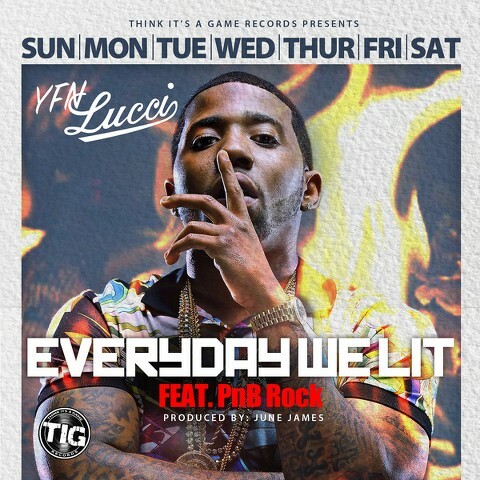 Today, Lucci unloads his official follow-up single, "Everyday We Lit" featuring Philly artist PnB Rock. Produced by June James "Everyday We Lit" is yet another instantly-infectious banger from the Atlanta native, further proving that he has what it takes to create top-notch music in a game where many artists fizzle out.